His name is Rafe, and he is everywhere Clarissa turns. At the university where she works. Her favorite sewing shop. The train station. Outside her apartment. Hi messages choke her voice mail; his gifts litter her mailbox. Since that one regrettable night, his obsession with her has grown, becoming more terrifying with each passing day. And as Rafe has made clear, he will never let her go. I was honestly pretty impressed with the writing quality in this one, particularly given that it's a debut. 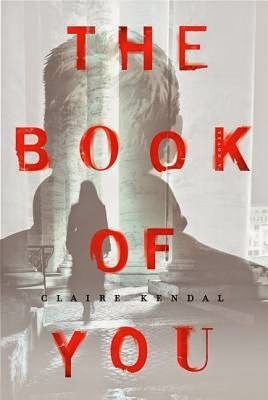 Kendal does a great job of creating characters who are both likable and believably flawed, as well as a villain who is absolutely loathsome - a must in a good thriller. My one complaint is that we are told the story in alternating viewpoints: from Clarissa's first person point of view in her journal and from a third person perspective, focusing on Clarissa. I really enjoyed the journal entries, but felt disconnected and thrown off during the third person portions. I couldn't put it down. It was deliciously creepy and I loved the suspense. I cared about the characters and was really into the story line. There were moments where I wondered if some things could have come out to cut the length down, but overall I really enjoyed the reading experience. I recommend it for fans of domestic suspense/psychological thrillers. It's intensely creepy without being graphically violent, although there are some very short instances of violence, including sexual assault, so it comes with a potential trigger warning. If you're interested, click here to see the book trailer. Thank you to TLC for letting me participate in the tour! Click here to see the rest of the tour stops. Wow! I'm so glad you liked the book! I'm going to be listening to it on audio in the next week or so.